An exterior view of the Mercedes-Benz Stadium in Atlanta. The winning players in Sunday’s Super Bowl LIII in Atlanta are guaranteed bonuses of $118,000 under their union contract for around three hours of work. That’s about 3 1/2 times the annual wage rate for the security guards working the event. It makes for a showcase in income inequality and job insecurity. The professionals on and around the front lines of the game, from New England Patriots quarterback Tom Brady to the officials to halftime music act Maroon 5, will be working under union contracts, while those working behind the scenes are being brought on part-time and lack representation. That’s due in part to Georgia being a so-called right-to-work state where only 4.5 percent of workers belonged to a union in 2018, ranking 46th out of 50 states and the District of Columbia. While at least five international unions will have members working the Super Bowl, “organized labor is underrepresented for many operational and concession contracts for the Super Bowl and other events at Mercedes-Benz Stadium,” Valerie Barnhart of Georgia’s AFL-CIO said in an email to Bloomberg Law. None of Mercedes-Benz Stadium’s full-time associates are unionized, according to stadium spokesman Jason Kirksey. The stadium’s food service workers, hired by concessionaire Levy Restaurants, are also not unionized. In several other NFL stadiums, such as New York’s MetLife Stadium, where the 2014 Super Bowl was held, the food service workers are unionized. On average, 6.6 percent of all workers in right to work states belonged to a union in 2017, while 14 percent of all workers in non-right to work states belonged to a union in 2017, according to Bloomberg Law data. Georgia’s union participation rate of 4.5 percent compares to 22.3 percent in New York. The unionization rate is lower in Georgia because unions struggle to gain the required majority support to unionize in the first place, National Right to Work Foundation vice president Patrick Semmens told Bloomberg Law. “Georgia’s longstanding Right to Work law doesn’t change how a workplace is organized, it simply ensures workers have the choice of whether or not to financially support the union’s activities, if organizers can convince enough workers to support unionization,” he said in an email. In right-to-work states, employees have the right to join a union, but are not compelled to do so. Workers in these states are not required to financially to contribute a percentage of wages to union activities if they’re employed in an organized workplace. Many vendors and employers in the state misclassify employees as independent contractors to keep operational costs down and bids low, Barnhart said. “Essentially, there is no actual law in Georgia that sets regulations on how and when a worker is classified as an employee rather than an independent contractor,” she said. The most prominently displayed union labor on Sunday will be the approximately 120 Los Angeles Rams and Patriots players on the field and the benches, represented by the National Football League Players Association. NFL officials are organized by the NFL Referees Association. The International Brotherhood of Electrical Workers, International Alliance of Theatrical Stage Employees, and Screen Actors Guild‐American Federation of Television and Radio Artists will all have members on the field and on the sidelines. The announcers, singers, dancers, and musical acts are SAG-AFTRA members, a union spokesperson told Bloomberg Law. This includes halftime show performers Maroon 5, Travis Scott, and Gladys Knight, as well as pre-show performers Tim McGraw, Martina McBride, and Zac Brown. And the workers who created the sets and will help transform the field at halftime are all members of IATSE. Three Georgia IATSE locals and one in CBS’ New York studio will be involved in the game. They’ll also help produce parties, the NFL Honors Ceremony, and the NFL Experience at the Atlanta Convention Center. 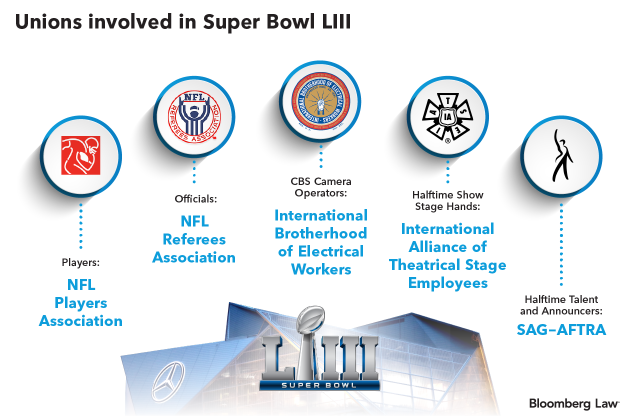 “For a major event such as the Super Bowl and the halftime show and all of that, not only are the individuals represented by the IATSE some of the best-skilled and best-trained individuals out there, but by being represented, they’re able to live a middle class lifestyle,” IATSE Stagecraft Department Assistant Director Joe Hartnett said. The television broadcast that reaches tens of million homes will also be the product of union labor. About 300 IBEW members working 15 job classifications will help produce the broadcast, according to IBEW Media Director Mark Brueggenjohann. That includes camera operators, audio technicians, and graphic artists. Beyond the stadium, unionized TSA workers, hotel staff, transportation operators, and food service employees across Atlanta will be facilitating guests during the weekend, she said.